The installation meeting of Royal Preston Chapter No 333 was honoured by the presence of the Deputy Grand Superintendent Paul Renton. 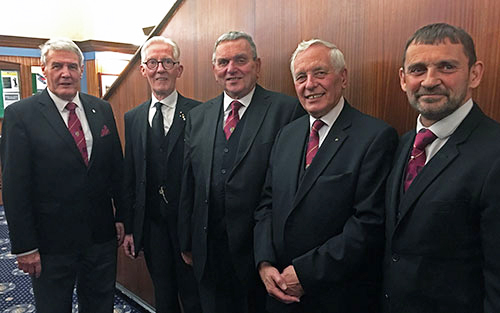 He was accompanied by Assistants to the Provincial Grand Principals, Michael Threlfall and Tony Hall, Preston Group Chairman Steve Bolton and Deputy Provincial Grand Director of Ceremonies David Thomas. They were supported by grand officers, Joe Collier, Stan Rigby and Geoff Saul and Provincial Scribe Nehemiah David Case. The three principals pictured from left to right, are: Peter Donnelly, David Poulter and Mel Johnson. The visitors were treated to an excellent although somewhat shortened installation ceremony with Peter Donnelly inducting his successor, Mel Johnson, as the third principal of the chapter, Geoff Saul, in turn, inducting Peter as second principal and David Poulter being proclaimed first principal for a further year. 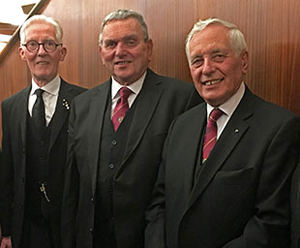 The third and second principals elect were, in turn, duly presented for installation by the director of ceremonies Mike Jones and invited to reaffirm their obligation. The scripture readings were delivered by David Caldecott and Patrick Bracewell respectively with all the associated prayers being spoken by Patrick Bracewell. A conclave of installed principals was declared and David Poulter was proclaimed as first principal by Mike Jones. Peter Donnelly was installed in the second principal’s chair by David and Mel Johnson in the third principal’s chair by Peter. The conclave was closed and companions readmitted to the chapter. Mike Jones declared the three principals as being formally installed in their respective offices. The scarlet, purple and blue robe addresses were given by Andrew Colosimo, Steve Grimshaw and David Radford respectively, all of whom gave faultless renditions. Following the investiture of officers, the address to the three principals was delivered in an excellent manner by Geoff Saul and that to the chapter officers in an equally commendable manner by Mike Jones. The address to the chapter companions was given by the principal guest, Paul Renton. At the conclusion of the installation ceremony, Paul brought the greetings and congratulations of the Grand Superintendent Tony Harrison, commenting that had he been present he would have witnessed a warm and sincere ceremony. On Tony’s behalf, he congratulated David on occupying the first principal’s chair for a further year and wishing him well. He also added his congratulations to Peter and Mel and wished all three the best of health to enjoy their year in office. Paul went on to congratulate Mike Jones for his work in directing and his significant contribution to the evening’s ceremony. He then thanked the acting Provincial grand officer David Case for his continuing support noting that David had been in attendance at virtually all his visits. The three principals and guests make their way to the festive board. Pictured from left to right, are: Paul Renton, Peter Donnelly, David Poulter, Mel Johnson and David Thomas. David in reply, thanked Paul for his kind comments on behalf of the Grand Superintendent and presented him with four cheques totalling £640. The first, to the value £200, was in support of Blood Bikes North West. The second, for £400, was in support of the MCF 2021 Festival. The other two cheques for £20 each were to the Masonic Fishing Charity and Preston Group Bowling Section. These donations were in addition to previous charitable giving during the year and a donation to Preston Masonic Hall. Paul congratulated the members of the chapter on the amount raised and, as a result of the latest donation to the Festival, presented the first principal with a certificate to acknowledge the chapter achieving Patron status. The proceedings in the chapter were drawn to a close with the valedictory address given by Richard Maddocks. Later in the evening, in response to the toast to the grand officers, Paul said he was pleased to have the company of fellow grand officers, Michael Threlfall, Tony Hall, Joe Collier, Stan Rigby and Geoff Saul. On his own behalf, he congratulated the chapter for what had been a sincere ceremony in a warm atmosphere where every part of it was well executed. He congratulated the three principals wishing them well for their year in office. He mentioned the excellent work of the companions who delivered the robe addresses in such a fine manner and thanked all the companions who had a part to play in the proceedings. Moving on, Paul thanked the Provincial Grand Scribe Nehemiah, David Case, for his unfailing support during the year and paid tribute to Provincial Deputy Grand Director of Ceremonies, David Thomas, for all the work he has done, and continues to do, around the Province having served in this role for over eight years. This achievement was generously acknowledged by the companions present. He continued by recommending Solomon, the UGLE’s online information tool which had nuggets of information to enlighten the brethren on all aspects of Masonic matters. He demonstrated its ease of use and accessibility by going on line to read an item about the historical meanings of the colours of Royal Arch Masonry. Paul acknowledged the generous donations by the chapter on behalf of the ultimate recipients and added that he was pleased to see so many companions wearing the Festival jewel. The festivities concluded with the toast to the three principals by Trevor Phillips with David responding followed by the janitor’s toast. Article and photographs provided by Trevor Phillips.